Ansonia Clock Co. Royal Bonn, "La Manche", C. 1904. My wife cabbaged onto this clock several years ago and just recently agreed to let me sell it. Case identical to #282 except for the color. 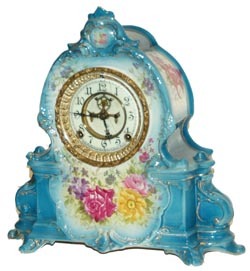 It is shades of blue all over except for the flowers all over the front and sides, and the usual gold accents. Clean original clock except for the metal back cover. It is black, not brass, and is not an Ansonia back cover. The outer ring of the two piece porcelain dial has some hairlines. If you want perfect and original, it isn\'t for you, if you want very nice and colorful, it will do wonderfully. Ly-Ansonia, page 615.